Just Opened for Christmas 2018! No time is more exciting in a child's life than the days leading up to Christmas. Their anticipation grows everyday at possibly catching a glimpse of Santa or what will be waiting for them under the Christmas tree on Christmas morning. 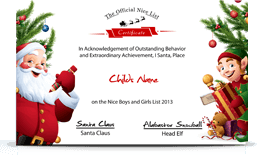 By sending letters from santa you can enhance their Christmas experience! Imagine the joy in your little one's faces to see they received a personal letter from Santa Claus himself delivered right to them at their house! 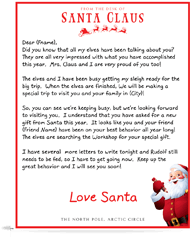 If you are looking for Christmas activities, we recommend you visit our favorite Christmas web site Santa Letter. They have a lot of fun things to do like Christmas Games, Christmas Coloring Pages, Christmas Trivia, Christmas Jokes, and many more fun Christmas Activities.